From lax safety standards, ineffective police, and drunk driving, operating a vehicle on the streets of Vietnam is a hazardous enterprise. People are now taking matters into their own hands. In Vietnam outbreaks of cholera, dengue fever or hand, foot and mouth disease are not uncommon. Last year hand, foot and mouth epidemics killed hundreds of children. Yet there is another not so obvious killer in Vietnam: driving. Often called the “hidden epidemic,” it is an increasingly serious problem with deadly consequences. 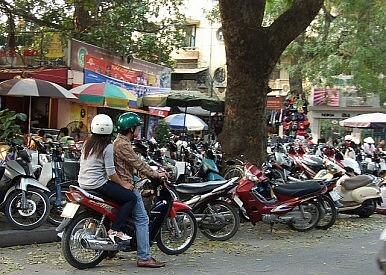 Traffic accidents are a serious problem here in Vietnam. Some 95 percent of registered vehicles are motorbikes or scooters. Vietnam’s rapid economic development over the past few decades has meant roads and traffic policing have not kept pace with the growing number of vehicles on the road. The nation has a very high traffic death toll rate, though just exactly how many traffic-related deaths there are is difficult to know as reliable data remains scarce. The Ministry of Public Security reported over 11,000 deaths in 2010; but the Ministry of Health registry – usually collected via the hospital system — lists 15,464 deaths. Yet these numbers may, in actuality, grossly understate the extent of the problem. Indeed, some sources believe that official data underestimates the number of traffic deaths by as many as 30%. There have been some efforts to improve safety – albeit with mixed results. For example, in 2007 a helmet law was introduced for government officials and expanded to include the public at large in early 2008. Similar laws had been tried before, however, with little impact. Motorcycle drivers simply carried on as usual and there was little government enforcement. Also, children under the age of 14 were exempt from the law. Most of the helmets that are available in the country are made of cheap, low quality plastic that don’t offer adequate protection. Jonathan Passmore of the World Health Organization in Hanoi has worked for years on traffic safety issues in Vietnam. He estimates that 80 percent of helmets fail to meet national quality standards. “Due to a lack of information in official data sources that don’t identify the road user type of the deceased, we have not yet been able to quantify the impact of the 2007 helmet law on deaths and injuries in motorcycle riders and passengers,” Passmore told The Diplomat via email. Nonetheless, Passmore does posit that there is a possible link between the law coming into effect and the small drop in traffic-related deaths in recent years. He also holds out hope that better data will be forthcoming later this year. However helmet laws won’t fix all the traffic problems in the country. An additional problem, for example, is the poor performance of the traffic police who are better known for issuing on-the-spot informal fines then regulating traffic in any systematic and effective manner. Not only does this make the police unpopular among the public, but, knowing the sorry state of law enforcement, many drivers feel free to disregard traffic rules altogether. It’s not uncommon, for example, for drivers to leisurely cruise down one-way streets going the wrong way. Speeding and drunk driving also contribute significantly to deaths in Vietnam, according to Passmore, but given the paucity of data it’s hard to identify exactly how widespread the problems are. In Vietnam the legal limit is 0.08 percent blood-to-alcohol rate. Despite new laws that target drunk driving, however, enforcement remains poor. In July this was highlighted when an American living in Hanoi for years made news when he began stopping motorbikes breaking traffic laws, such as going the wrong way up one way streets. He did this with the sanction of local police while the incident was filmed by the TuoiTre Newspaper. It quickly gained a great deal of attention online and was soon translated for their English-language publication. What was interesting was how divided opinions were between Vietnamese and expats: many of the latter believed that, as a guest in Vietnam, he should leave the situation alone. However natives were generally positive, pointing out how bad the traffic had become and how careless many drivers are. Vietnam Comes of AgeUrban Poor's 'Everyday Struggle' in VietnamVietnam’s Carefully Managed AngerVietnam’s Murky Media PictureVietnam’s China Backlash?